I spoke to Allison Coe recently about Twin Flames—recounting the fascinating way in which we’ll all interact with each other once we bridge into the New Earth. I asked about it because it’s something that’s never been mentioned in any of her videos—and because this is brand-new information that Allison has allowed me to share with all of you. Twin Flames for me (and I’m sure for many of you out here), has been a huge proponent in the Ascension process; particularly in the awakening part of the Union. My own Twin (bless her soul), was such a beautiful apex of searching what I have been missing all of my entire life—teaching me the push-and-pull lesson(s) of eventually finding myself, of contributing to society, and the symbiotic purpose of simply being in service. To this day, my Twin is still schooling me (no matter how much meditation I do, how hard I work at anything, or how much answers I seek from within). I can only hope this video I worked on with Allison will enlighten us even further; breaking these third-dimensional belief systems of what it truly means to embody unconditional love, especially when that alignment coincides with the new relationship dynamics heading into the New Earth. In the New Earth, everyone—and every relationship, is important. It’s a communal, co-operate and co-creative existence where our relationships are reciprocal; truly defining the realization and the power, that is of unity consciousness. As a researcher myself (studying evidence-based practices of qualitative and quantitative data), I know Allison speaks the truth; trusting the validity and reliability of her research, acquired meticulously from her Quantum Healing Hypnosis Technique (QHHT) practice and directly from her clients and her client vlog reports. Because of this, and because of many QHHT practitioners like the late-great Dolores Cannon and modern pioneers like Alba Weinman and Candace Craw-Goldman, these amazing practitioners have provided us with such clues with compelling information from multiple-different sources (whom almost-all have no direct contact with each other); preparing us for such things like The Event, and transitioning into the New Earth. There is definitely something there—and we need to pay attention when synchronistic sources like these are being offered to us in plain sight (e.g., seeing 11:11 on the time, everyone being connected to the One Infinite Creator according to the Law of One, “doing unto other others” from the Golden Rule, the Western Hermetic traditions of as “above, so below,” etc.). Not only that, I know that many of us (awakening or already have awakened) will want to hear what Allison has to say. No doubt about it. When it comes to relationships, when it comes into a transitioning into a new world, when it comes to realizing that you are powerful way beyond measure from all these past and preconcieved conditions, where anything and everything is vibrationally and profoundly possible—that’s when we have to pay attention. And at this critical nexus point, it’s definitely no longer the spiritual community that has taken interest into this, but everyday people and everyone in general. Again, everyone and every relationship is important. Whether it would be with our Twins, Soulmates, Karmic, you name it—we’re all in this together. Thank you all; I appreciate you all, and I send you all with so much love, light and blessings. 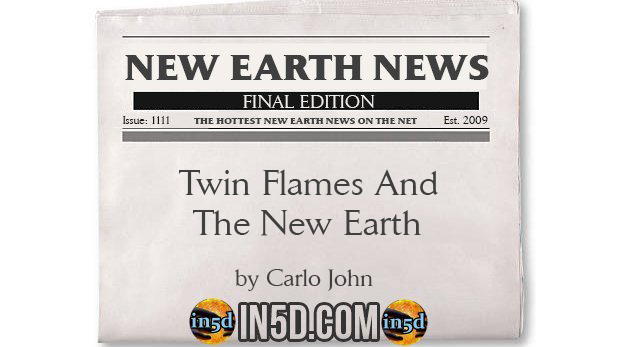 At any day now, the New Earth will come—and I hope this video, and our continual efforts in creating this new world, will better bridge the connection we have towards each other. About the author: Carlo John is a Certified Life Coach and Counselor. He is currently obtaining his Master of Science (MS) Degree in Professional Counseling; specializing in addictions, depression, suicidal ideation, and rehabilitation therapy. He is an Air Force veteran with prior service(s) overseas in Italy—with an additional Bachelor’s of Fine Arts (BFA) Degree in Film and Television, being a Producer and Editor. He changed careers from experiencing a very profound and powerful Kundalini awakening during the summer of 2014; which by now, is making his life’s mission to help to those in need and to simply be of service.